A hip fracture occurs when the proximal end of the femur, near the hip joint, is broken.About one-third of elderly people living independently fall every year, with 10% of these falls resulting in a hip fracture. Such a fracture is a serious injury that occurs mostly in elderly people over 65 years and complications can be life-threatening. (level of evidence 1A) The femur is the largest and strongest bone in the body, so it requires a large or high impact force to break. Most femur fractures are the result of a high energy trauma, such as a motor accident, gunshot wound, or jump/fall from a height.However, in an older population, a simple fall may cause a femoral fracture due to reduced bone mineral density. A femoral fracture is a very serious injury and needs 3-6 months to heal. High mortality, long-term disability and huge socio-economic burden are the main consequences of a hip fracture. The biggest risk factors for running up a hip fracture are osteoporosis and cognitive impairment. The hip joint is a ball and socket joint, formed by the head of the femur and the acetabulum of the pelvis. In 1990 there were estimated to be 1.66 million hip fractures around the world, and it’s also estimated that this number will rise to 6.26 million in 2050. It is known that there will be more old people in 2050 than in 1990, this is the biggest cause of the big raise. Most of the hip fractures occur in North Europe and in the USA, the regions with the least hip fractures are Latin America and Africa. In Asia there is an immediate number of hip fractures. But it’s estimated that most of the hip fractures will occur in Asia by 2050. 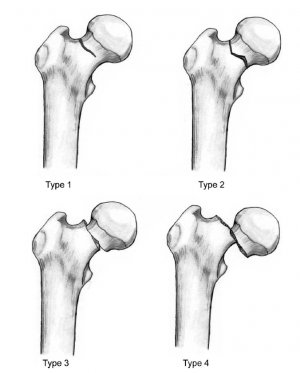 Hip fractures can be classified into intracapsular and extracapsular fractures (figure2). 1) Intracapsular fractures: also known as femoral neck fractures. It occurs within the hip capsule and accounts for 45% of all acute hip fractures in the elderly. It mostly results from a low-impact fall from a standing position or from twisting on a planted foot. Femoral neck fractures are susceptible to malunion and avascular necrosis of the femoral head because of the limited blood supply to the area. Intracapsular fractures are further classified as nondisplaced or displaced based on radiographic findings (figure 3). 2) Extracapsular fractures: could be an intertrochanteric fracture or subtronchanteric fracture. 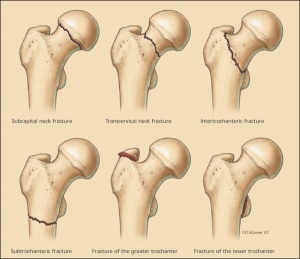 Intertrochanteric fracture: occurs between the greater and the lesser trochanter. Majorly occurs in the osteoporotic geriatric population and result from a fall from a standing height with direct contact of the lateral thigh or torsion of the lower extremity. The intertrochanteric region has a good blood supply, avascular necrosis or nonunion is rare. A substantial portion of the population is at risk of hip fracture by virtue of low bone mass and frequent falls. Fracture incidence rates rise dramatically with age, and populations are aging rapidly around the world. Due to the sheer size of the affected population, control programs for osteoporosis are likely to be expensive, but effective and efficient prevention efforts have great potential promise.The incidence rates themselves are rising in some regions, and any further improvements in life expectancy will compound the problem. Osteoporosis: Osteoporosis is a multifactorial, chronic disease that may progress silently for decades until characteristic fractures occur late in life. Medications: Some medications can cause a decrease in bone density like cortisone. Nutrition: It is well known that calcium and vitamin D increase bone mass, so a lack of it can cause several fractures, including hip fractures. Some eating disorders like anorexia and bulimia can weaken your bones, zo you become more fragile to have a hip fracture. Age: the older you get, the higher the risk is for hip fractures. 90% of these fractures occur in persons over 70 years old. Physical inactivity: Physical activity is very important for the muscle mass and the bone mass, so if you practice enough sports you will have less risk to have hip fractures. Stroke disease increases risk factor for falls which can cause a hip fracture. Parkinson’s disease increases risk factor for falls which can cause a hip fracture. Risk factors other than low bone mineral density (BMD), defined by the National Osteoporosis Foundation (National Osteoporosis Foundation, 1998) are previous history of fracture as an adult, history of fracture in a first-degree relative, low body weight, and current cigarette smoking.Another risk factor that is frequently discussed for the last years is the proximal femoral geometry, it is suggested as an important marker for the hip fracture risks. 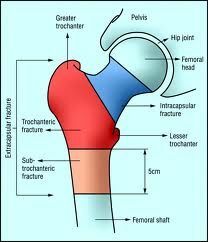 The diagnosis of a hip fracture is established based on patient history, physical examination, and radiography. The majority of hip fractures are found by plain radiography, the initial imaging modality used in the diagnosis of hip fracture, which has a sensitivity ranging from 90%-95%. Occult hip fractures are not detectable by radiography, MRI has been shown to have 100% sensitivity and 100% specificity in diagnosing occult hip fractures. Standard x-ray examination of the hip includes an anteroposterior (AP) view of the pelvis and an AP and cross-table lateral view of the involved hip. Plain x-rays without evidence of fracture do not exclude the diagnosis of hip fracture. If MRI is contraindicated,a bone scan is an alternative imaging option. Bone scans have a sensitivity of 93% and specificity of 95% in detecting occult hip fractures.CT scan is another modality that can be used to diagnose occult hip fractures, although its efficacy has been proven by few studies. International Hip Outcome Tool (iHOT): The test consists of 33 questions that relate to Symptoms and Functional Limitations, Sports and Recreational Activities, Job-Related Concerns, Social, Emotional, and Lifestyle Concerns. iHOT is one of the most carefully and comprehensively validated outcome measures in orthopaedic surgery. Each question has a Visual Analogue Scale (VAS) line where the patient has to put on a marker. The total score is a calculation of the mean of all VAS scores measured in millimeters. Cumulated Ambulation Score (CAS) is a valid tool to evaluate the basic mobility from patients with hip fracture. The test is highly recommended after hip fractures to test the basic mobility. Certainly recommended for hospital treatments. Timed Up and Go Test (TUGT) is used to test the functional mobility level.The test consists in rising from a chair, walk 3 meters on a straight line, turn around and go back to the chair and sit down. When the time is less than 10 seconds, it indicates a normal mobility. Between 11-20 seconds are normal limits for frail elderly and disabled patients but for others it’s an indication for examination and has a higher fall risk. Greater than 20 seconds, there is need to further examination and intervention. Chair Stand- Test The amount of time it takes to rise and sit back from a chair or the number of times someone can rise from a chair in 30 seconds. The test was performed with the person sitting on a chair (height 45 cm) without arms, but a chair with arms was used if the patient was unable to stand without the use of the armrests. The patient was instructed to stand and sit from a seated position as many times as possible within 30 seconds. FIM transferring (a 3-item scale focusing on transfers from the bed, toilet, and tub). In the study of Diamond TH et al. the main prognostic factors such as pre-existing illness and osteoporotic risk factor; outcome data such as fracture-related complications, mortality, and level of function as measured by the Barthel index of activities of daily living at 6 and 12 months postfracture. 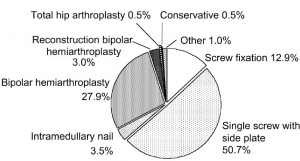 The results of these outcome measures are that fracture-related complications affected similar proportions of men and women (30% v. 32%), and mean length of hospital stay was similar. Fourteen percent of men died in hospital compared with only 6% of women (P = 0.06). Men had more risk factors for osteoporosis (P < 0.01). Physical functioning (measured by the Barthel index) deteriorated significantly in men from 14.9 at baseline to 13.4 at six months (P < 0.05) and 12.4 at 12 months (P < 0.05) after fracture. limited and painful hip range of motion, especially in internal rotation. Pain is noted upon attempted passive hip motion. Ecchymosis may or may not be present. An antalgic gait pattern may be present. Tenderness to palpation around the inguinal area, over the femoral neck. This area may also be swollen. The management of hip fracture is usually a combination of surgery and rehabilitation. It also depends on the location of the fracture and whether it is displaced. In comparison to conservative management (bed rest and traction), operative management results in a reduced length of hospital stay and improved rehabilitation. Surgery <48 hours after admission may be associated with lower morbidity and may decrease hospital stay. It is associated with a 29% risk reduction in mortality as well as a significant reduction in in-hospital pneumonia (relative risk reduction 41%) and pressure sores (relative risk reduction 52%). For patients < 60 years of age, most surgeons favor early (<12-24 hours from injury) open reduction and internal fixation partly due to a potential increased risk of avascular necrosis to the femoral head. However, the evidence is conflicting regarding rates of avascular necrosis and timing of surgery. The patient training begins the day after surgery from a sitting position, with abducted hip during transfer from bed to chair. (Level of evidence: 5) On the second and third post-operative day the patient can start with walking between parallel bars, and later on, they can walk with a walker or a cane. A warming up on a stationary bicycle for 10 to 15 minutes is recommended. (Level of evidence: 2a) Progressive weight-bearing as tolerated till full weight-bearing should start soon after surgery according to general physical status. When internal fixation is performed, partial weight-bearing is recommended for a period of 8–10 weeks (according to the radiological evaluation of fracture healing), and after 3 months full weight-bearing should be allowed. Range of motion exercises for the hip, knee and ankle. The patient can also begin strengthening exercises based on the surgeon's orders (typically six weeks post-op). Patients should also undergo balance and proprioceptive rehab and these abilities are quickly lost with inactivity. 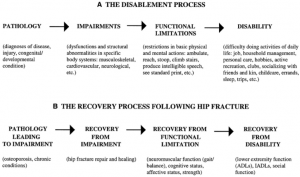 Another key component of rehabilitation following hip fracture is education on its prevention. Home safety to prevent falls, regular moderate exercise can slow bone loss and maintain muscle strength, also improve balance and coordination. Weight-bearing exercises are very important for mobility, balance, activities of daily living and quality of life(Level of evidence: 1a), examples: stepping in different directions, standing up and sitting down, tapping the foot and stepping onto and off a block. The number of hip fractures worldwide will increase up to 7-21 million incidences each year in 2050. Mortality associated with a hip fracture is about 5-10% after one month. One year after fracture, about a third of patients will have died, compared with an expected annual mortality of about 10% in this age group.Thus, only a third of the deaths are directly attributable to the hip fracture itself, but patients and relatives often think that the fracture has played a crucial part in the final illness. More than 10% of survivors will be unable to return to their previous residence. Most of the remainder will have some residual pain or disability. Most people who sustain the injury require surgery followed by a period of rehabilitation.Treatment is generally surgical to replace or repair the broken bone. Some loss of function is to be expected in most patients. ↑ Tinetti ME, Kumar C. The patient who falls: “It's always a trade-off. JAMA. 2010 Jan 20;303(3):258–266. ↑ 6.0 6.1 Zuckerman JD. Hip fracture. N Engl J Med. 1996 Jun 6;334(23):1519–1525. ↑ Canale ST. Campbell's Operative Orthopaedics. St. Louis, MO: Mosby;; 1998. pp. 2181–2223. ↑ Garden RS. The structure and function of the proximal end of the femur. J Bone Joint Surg Br. 1961 Aug;43B(3):576–589. ↑ Banks E, Reeves GK, Beral V, Balkwill A, Liu B Roddam A. Million Women Study Collaborators. Hip fracture incidence in relation to age, menopausal status, and age at menopause: prospective analysis. PLoS Med. 2009 Nov;6(11) e1000181. Epub 2009 Nov 1. ↑ Angthong C, Suntharapa T, Harnroongroj T. [Major risk factors for the second contralateral hip fracture in the elderly] Acta Orthop Traumatol Turc. 2009 May-Jul;43(3):193–198. Turkish. ↑ Dominguez S, Liu P, Roberts C, Mandell M, Richman PB. Prevalence of traumatic hip and pelvic fractures in patients with suspected hip fracture and negative initial standard radiographs—a study of emergency department patients. Acad Emerg Med. 2005 Apr;12(4):366–369. ↑ Lee YP, Griffith JF, Antonio GE, Tang N, Leung KS. Early magnetic resonance imaging of radiographically occult osteoporotic fractures of the femoral neck. Hong Kong Med J. 2004 Aug;10(4):271–275. ↑ Lim KB, Eng AK, Chng SM, Tan AG, Thoo FL, Low CO. Limited magnetic resonance imaging (MRI) and the occult hip fracture. Ann Acad Med Singapore. 2002 Sep;31(5):607–610. ↑ Holder LE, Schwarz C, Wernicke PG, Michael RH. Radionuclide bone imaging in the early detection of fractures of the proximal femur (hip): multifactorial analysis. Radiology. 1990 Feb;174(2):509–515. ↑ Magaziner J, Simonsick EM, Kashner TM, et al. Predictors of functional recovery one year following hospital discharge for hip fracture: a prospective study. J Gerontol. 1990;45:M101-M107. ↑ 29.0 29.1 Gretchen M Orosz et al., Association of Timing of Surgery for Hip Fracture and Patient Outcomes. JAMA. 2004;291(14):1738-1743. ↑ Mak JC, Cameron ID, March LM; National Health and Medical Research Council (Australia). Evidence-based guidelines for the management of hip fractures in older persons: an update. Med J Aust. 2010;192:37-41. ↑ Khan SK, Kalra S, Khanna A, et al. Timing of surgery for hip fractures: a systematic review of 52 published studies involving 291,413 patients. Injury. 2009;40:692-697. ↑ 38.0 38.1 Bhandari M, Devereaux PJ, Tornetta P 3rd, et al. Operative management of displaced femoral neck fractures in elderly patients. An international survey. J Bone Joint Surg Am. 2005;87:2122-2130. ↑ Bhandari M, Devereaux PJ, Swiontkowski MF, et al. Internal fixation compared with arthroplasty for displaced fractures of the femoral neck. A meta-analysis. J Bone Joint Surg Am. 2003;85-A:1673-1681. ↑ 41.0 41.1 Parker MJ, Gurusamy K. Internal fixation versus arthroplasty for intracapsular proximal femoral fractures in adults. Cochrane Database Syst Rev. 2006;(4):CD001708. ↑ National Institutes of Health (NIH). Osteoporosis prevention, diagnosis, and therapy. NIH Consens Statement. 2000;17:1-45. ↑ Johnell O, Kanis JA, Oden A, et al. Predictive value of BMD for hip and other fractures. J Bone Miner Res. 2005;20:1185-1194.